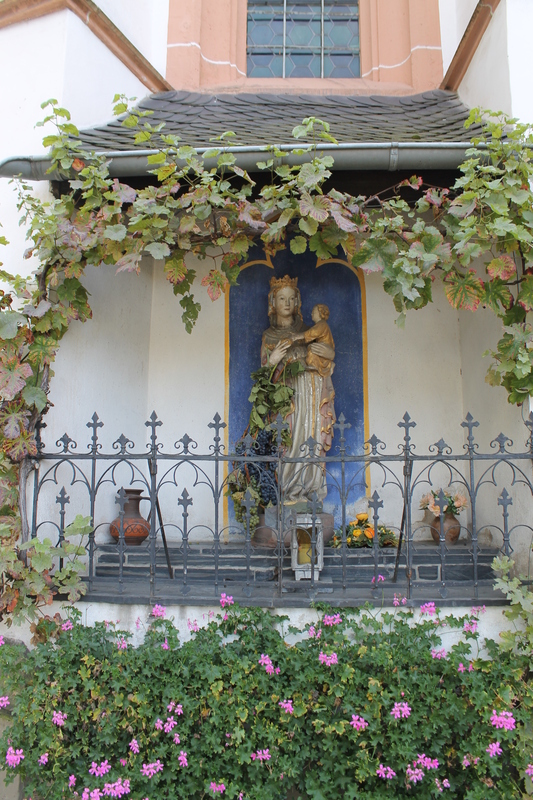 While I was visiting the Schnuetgen Museum in Cologne I also had the opportunity to visit Boppard. 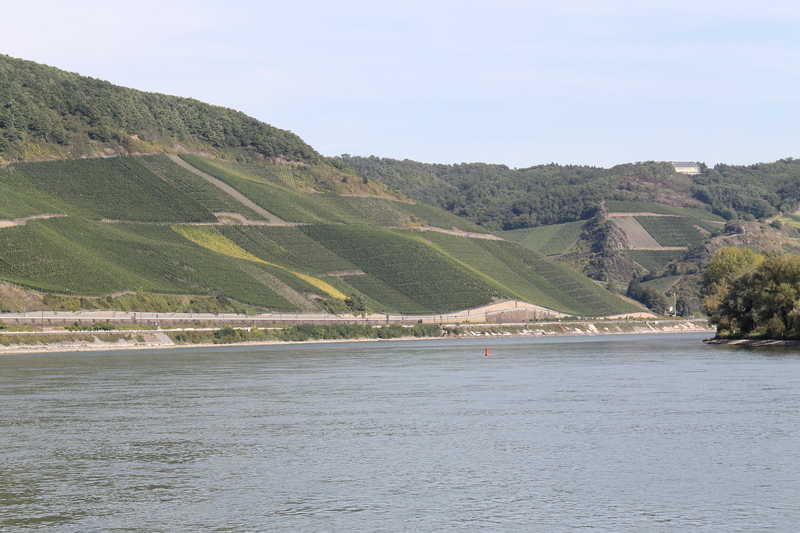 It is a very picturesque town, situated on a big bend of the Rhine just south of Koblenz in a region characterised by vineyards. The main church building was completed in 1359 and in 1445 the north nave was added. The stained glass that would have been in the main church is lost and there seems to be no information about it. When we refer to stained glass from Boppard, we always mean the windows that were made for the north nave (ie the extension) between 1440- 46. There were 7 enormous windows, each with three lights and each with a lower and an upper tier. 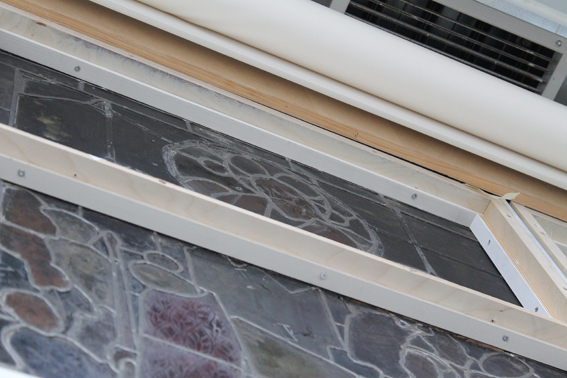 Each window had 42 panels and in total there would have been 294 panels with approx 450 m² of stained glass in the church. It seems that all this stained glass survived in situ until 1818 but by that time the windows were severely damaged. 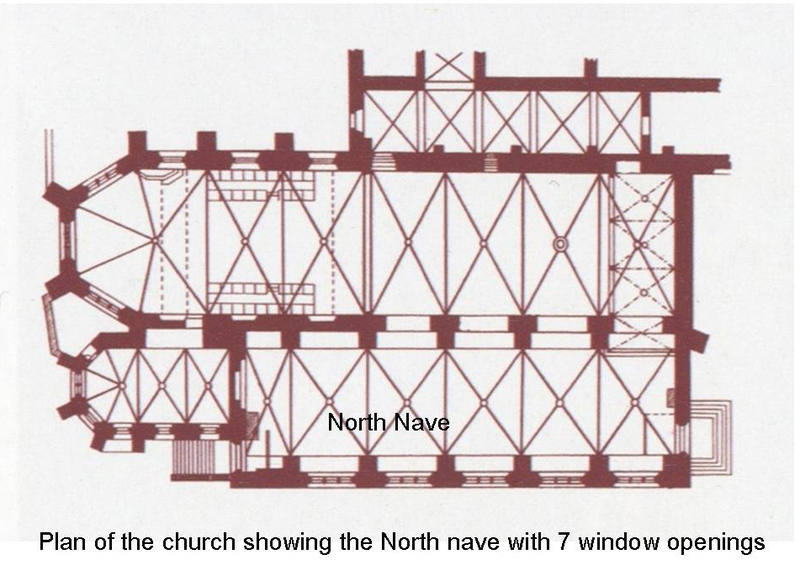 A contemporary witness stated that ‘the wind blew terribly through the church because of the big gaps and missing sections in the stained glass windows’*. He also said that ‘what remained was beautiful and a work of art’ *. 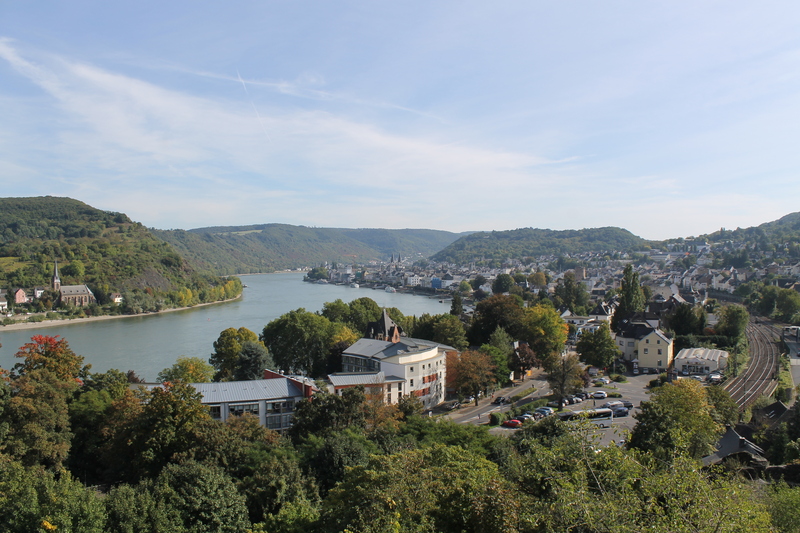 Boppard had a turbulent history; during the 30 year war (1618 – 1648) it was under Swedish occupation and lost about a third of its population. From 1794 to 1814 the town was occupied by the French army. 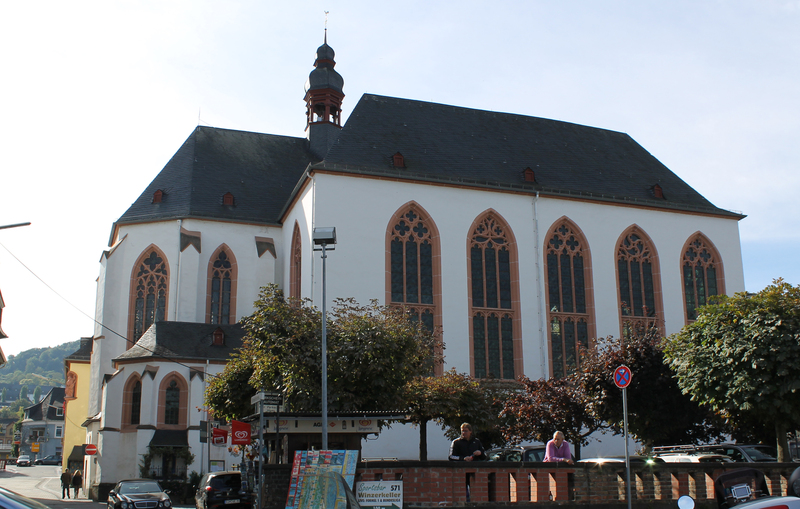 The monastery was disbanded and the church with the stained glass became the property and responsibility of the city of Boppard. 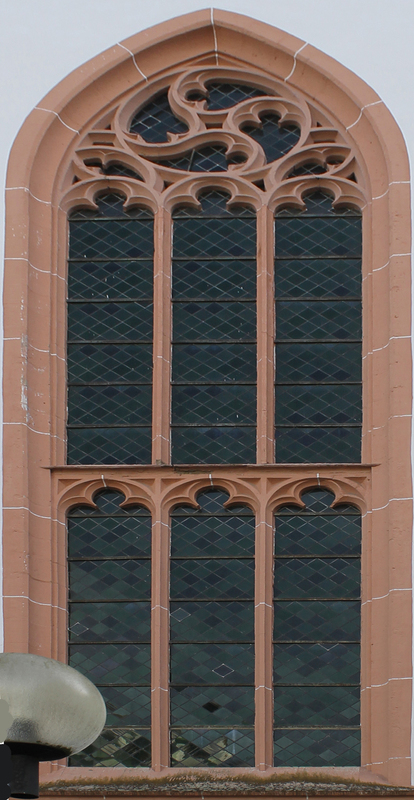 It is perhaps understandable that the city fathers had other worries than the repair of 7 enormous, deeply religious, medieval windows celebrating the cult of the Virgin and so when in 1818 Prince Hermann von Pueckler made them an offer for the glass, they were perhaps relieved to be rid of the responsibility. 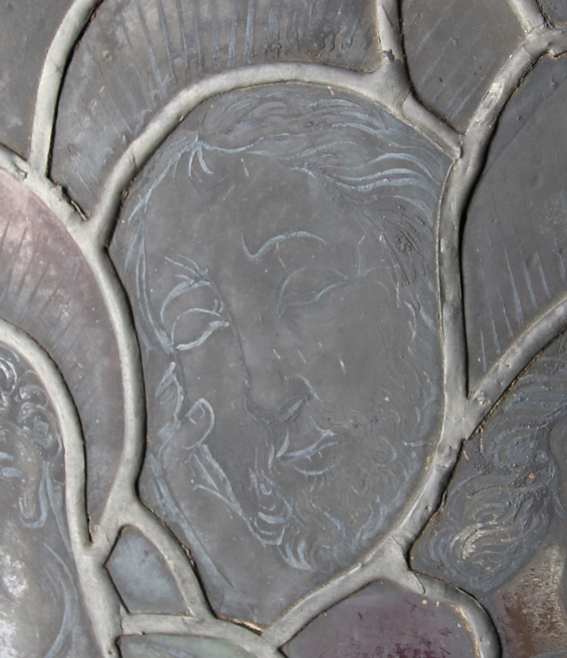 This act may also have contributed to the survival of much of the stained glass. 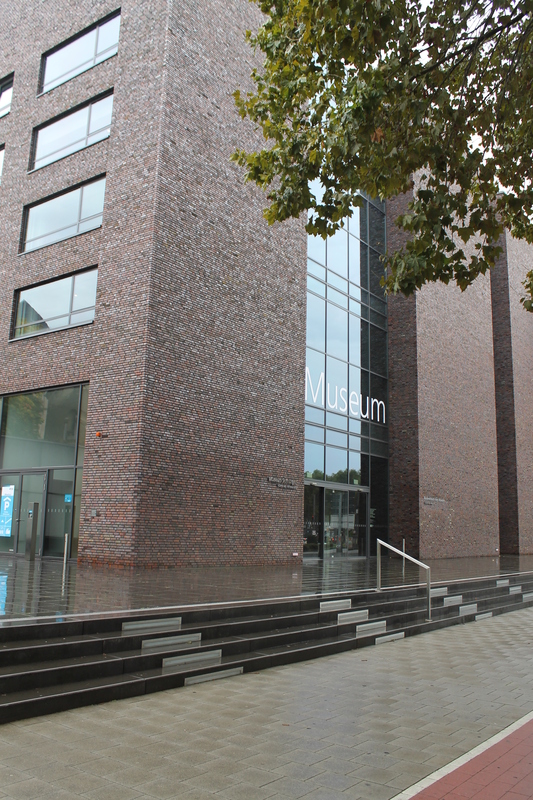 In 2010 the Schnuetgen Museum was moved to a new building that it now shares with the world cultures Rautenstrauch-Joest Museum. The complex is also referred to as the “Kulturquartier am Neumarkt”. The whole lower half of the 10 Commandments Window from Boppard is on display here, beautifully lit and easily accessible for a curious conservator. 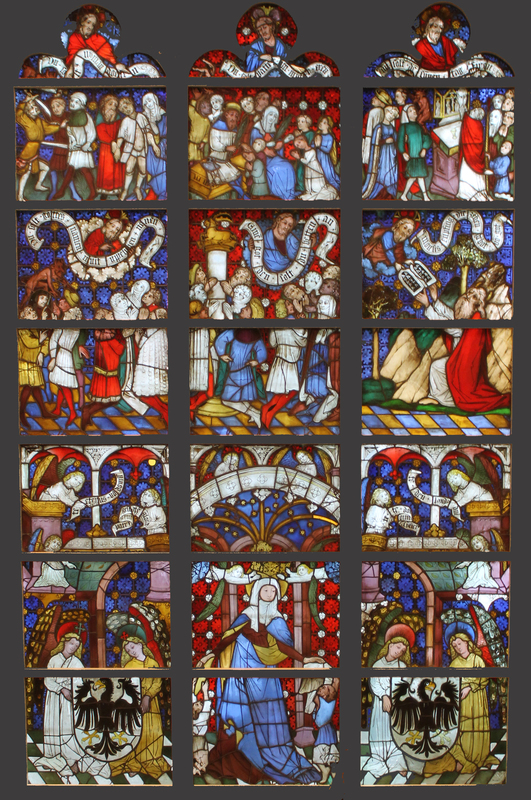 This window was acquired from the Spitzer Collection in 1893 by the collector Caspar Bourgeois from Cologne. His collection was auctioned in 1897 and the window was then bought by the Kunstgewerbe Museum in Cologne and in 1932 amalgamated into the Schnuetgen collection. 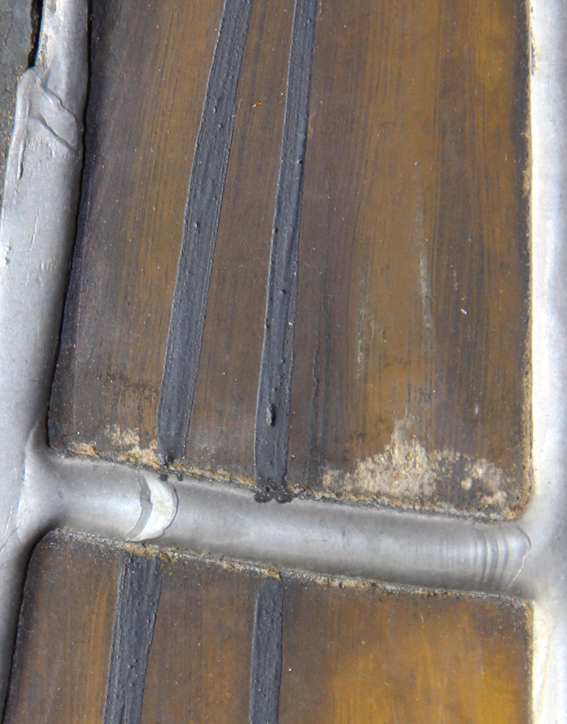 The Burrell and the Schnuetgen panels were separated in 1893 – so every restoration they have in common must have been added earlier than that date. It is very interesting to see how much they have in common. 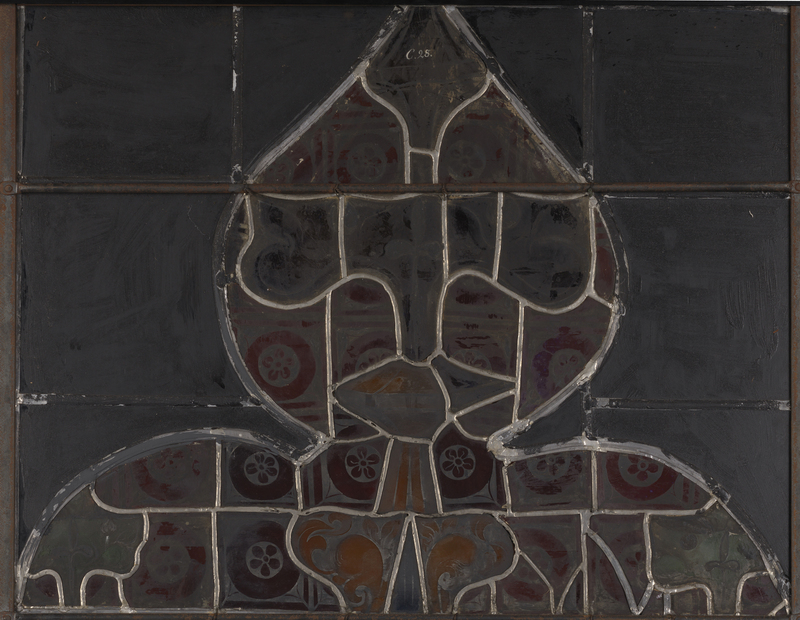 For instance the windows in both collections have been retouched with a cold (unfired) grey paint which can often be found on edges of the lead as well – we assume this work was carried out by the Royal Institute for Glass Painting in Berlin in 1871. When you look at the back of some of the Schnuetgen panels you can see at the very top that the tracery is leaded into a black quarry background. This was done to square the panels off and make them easier to frame. The quarries were then painted black – with a water-based paint which was also -rather carelessly – applied over the lead. The interesting thing about this is that we have the same intervention at the Burrell! So this means that the quarries were added either in the Berlin workshop, or while the glass was in the care of the collector Friedrich Spitzer. I tend to think that the Royal Institute of Glass Painting in Berlin would have had slightly higher standards – even if it was only to black out the gaps in a square frame. So here is another alluring reason to explore Friedrich Spitzer and to find out more where – and how – the glass was displayed while it was in his care for 18 years. Images of saints were an important devotional aid in the medieval period, and were found throughout churches, not just in the stained glass, like the Boppard panels, but also paintings, sculpture and other art forms. They were popular in public and private worship as a tangible connection to the saints during prayer. A good example of standing saints in other art forms in the Burrell is the retable, below. A retable is a framed altarpiece that is placed just behind and perhaps slightly raised from the altar. This retable is from Burgundy in France and dates to around 1450 to 1500. It shows Christ on the cross (a direct link to the Eucharist, the central focus of the medieval mass) with the Virgin Mary on his left and John the Evangelist on his right, with four other saints. Each saint is shown with their attribute, to illustrate who they are. The retable would originally have been beautifully painted, only traces of which are now left. John the Evangelist is usually regarded as the same person as John the Apostle and John of Patmos, who wrote the Gospel according to John in the New Testament. He is seen here holding his book. St. Peter is next on the right. He holds what is left of a key (the key to heaven) in his left hand and an open book in his right hand. It is generally agreed by scholars that Peter told his memoirs to John Mark of Rome, who then wrote the Gospel of Mark. Last on the right of the retable is St. Andrew, the brother of St. Peter. According to tradition, when crucified, he asked to be put on a Crux decussate, an X-shaped cross, or “saltire”, as he was unworthy of being crucified on a similar cross to that of Jesus. To the left of Mary stands John the Baptist, holding his attribute, a lamb, and wearing the camel-skin coat of the Gospels. 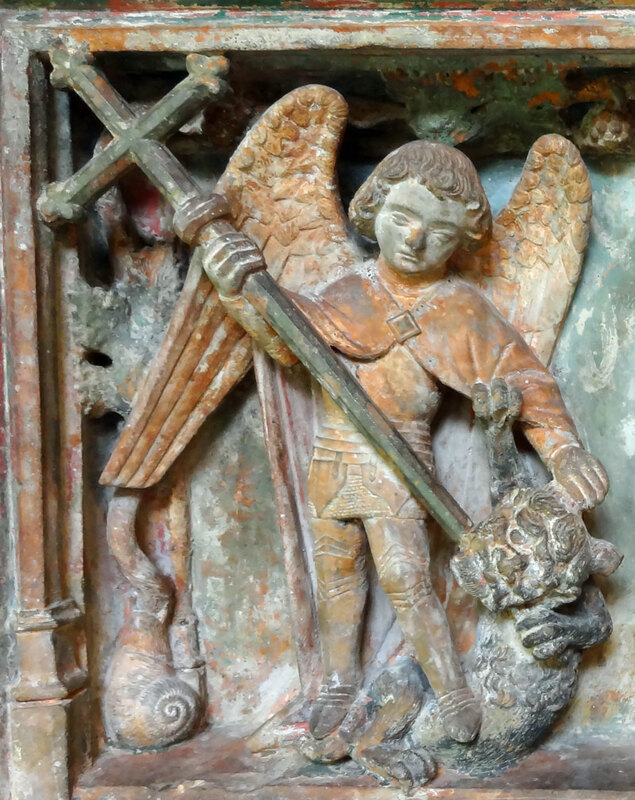 Originally, I said that the saint on the left was St. George and the dragon, but Malcolm Shaw, a Burrell guide, has pointed out that it is not St. George, but more than likely the Archangel St Michael fighting the devil. 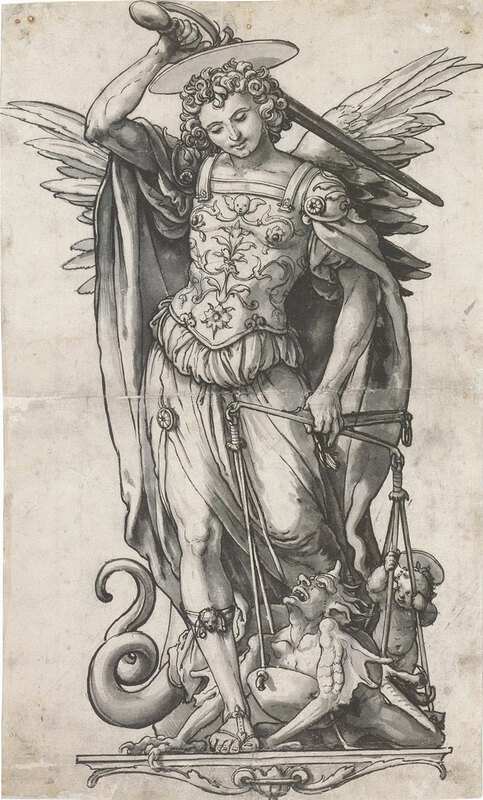 The image below is “The Archangel Michael as the Weigher of Souls” by Hans Holbein the Younger, painted in the early 16C.